The country of Georgia is one of the oldest wine regions in the world, with evidence of winemaking dating back some 8,000 years. It’s been done the same way for centuries using clay pots called qvevri that are buried underground and passed on from generation to generation. But as strong as Georgia’s wine traditions are, they can be overshadowed by something stronger. That something is a spirit called chacha, and the liquor’s importance is evident within hours of being in the country. On a trip to the Kakheti wine region, we squeezed into a shared taxi that was ripe with the smell of cigarettes and booze. Before we arrived — and while still in the car — we were presented with a toast of clear liquor. As we shot back the aromatic drink, we realized our trip was about to be hijacked by the beverage. Georgian chacha is similar to Italian grappa, but the drinking habits of Georgians and Italians are quite different. 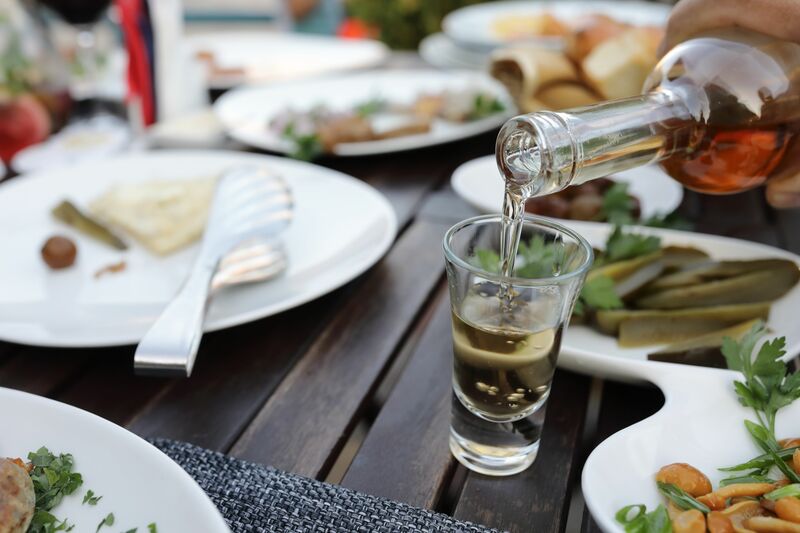 Italians savor grappa after meals and “correct” their coffee with it. In Georgia, no meal, however casual, feels complete without chacha’s digestive powers and invigorating burn. So much so that surviving a trip to Georgia largely depends on how you stomach unrefined liquor. Chacha is made from grape skins, or pomace, leftover from wine production. The skins are a byproduct that most modern wineries toss out, but Georgia cherishes grape skins. What others consider trash, or at best compost, Georgian winemakers prize. Chacha is also known as “grape vodka” in some areas. The comparison is likely from Soviet-era influences on Georgia, but chacha, even the fancier stuff, is much rawer than vodka. For better or for worse, chacha never has its flavors stripped through charcoal filtration or multiple distillations. The drink is everywhere in Georgia, from commercial versions in stores, to homemade chachas on dinner tables, to the occasional taxi drink. Regardless of where you come across it (and you will definitely come across it), chacha remains a folk liquor that’s mostly homemade. Pretty much every restaurant and bar serves chacha, and the source of a restaurant’s chacha are often mysterious. It may be poured from an unlabeled bottle or an unmarked plastic jug. Don’t worry, it’s safe to drink. If the producer isn’t listed on the menu, it’s probably just a village chacha, which will be cheap and probably smell like diesel. Commercial chacha tastes much like grappa, but the homespun stuff most often served is more like eye-watering moonshine. The variation comes from the practice of amateur chacha makers adding other fermented fruit to the mix, which makes it more similar to the backwoods brandies of the Balkans (rakia) than refined grappa. Chacha is typically served in ice-cold carafes or by the bottle during traditional Georgian feasts, or supras. Throughout the meal, toasts are made by the tamada, or toastmaster, who can raise a glass to anything from the environment, to religion, to the future. A shot of chacha follows each toast — and there are typically many of them. It’s similar to how soju is consumed with meals in Korea, or vodka in Russia. The first thing to remember during these toasts is that while a winery’s commercial chacha is usually diluted to the standard 40-percent ABV, homemade chacha may be over 60-percent ABV. Pro tip: Drinking chacha on an empty stomach is a rookie move. Georgia has excellent wine shops, and there are many fancy restaurants to taste artisan chacha if you’re looking for something higher end. On our trip to Georgia, we found that our favorite places to enjoy chacha is at khinkali houses. Khinkali, Georgia’s version of soup dumplings, is one of Georgia’s more famous snacks, and it’s a meal that locals and tourists enjoy with equal gusto. The chacha served at khinkali houses is ordinary, but it’s more about the ritual. First, take a swig of chacha and slurp out the soup as a chaser. After a moment to recover, you can eat the remaining solid components of the khinkali. Repeat as many times as you can stand to. If you’re in Tbilisi, the best dumpling house is the famed Zakhar Zakharich near the Dry Bridge. The chacha is cheap and the lamb khinkali are superb. If you’re in Western Georgia don’t miss El Depo in Kutaisi. It’s a 24-hour khinkali shop with a great beer selection, oversized extra-juicy khinkali, and, of course, ice cold carafes of chacha. It might be our favorite 24-restaurant in the world, and it’s the perfect place for a midnight chacha binge.